Kochi : The India's second-largest telecom service providers Vodafone India, today announced the launching of its much-awaited high speed 4G network services in the country, on the FDD-LTE 1800MHz band. The 4G mobile services will start in Kochi-Kerala from Monday, December 14. The ultrafast speeds offered will enable Vodafone 4G customers to access internet via mobile with ultrafast speeds across a range of smart devices including Mobile Wi-Fi. 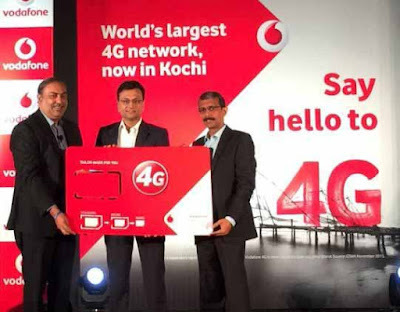 With the launches of high speed 4G network services, Vodafone now becomes the second Telecom operator after Airtel to introduce 4G service in Kerala. Vodafone already offers 3G services in Kerala on the 2100MHz band, and claims with the rollout of 4G it will be the first telecom operator in Kerala to offer 2G/ 3G/ 4G services on its own radio. Sunil Sood, MD & CEO, Vodafone India said, “We are delighted to launch our ultrafast 4G services in India that will give customers the power to experience the most advanced wireless broadband experience available across the globe today." "As a steadfast partner of Digital India, we remain focused on deploying multiple technologies – be it 2G, 3G and now 4G – for optimum use as each technology has its own vital role to play in servicing the myriad connectivity needs of consumers across the country,” he added. Existing subscribers in Kochi can avail of a free upgrade to 4G services along with a new 'Superfast 4G SIM'. Vodafone will increase the intensity of its 4G rollout covering important metros – Mumbai, Delhi, Bangalore and Kolkata in the first phase. Vodafone had first announced a December rollout time-frame in August, following Airtel's launch of its 4G services the same month. Over the past four months, Vodafone India has been testing its upcoming 4G services and partnering with global technology infrastructure service providers for the network rollout.